Kate’s brother Paddy continues to explore and share his passion for Malagasy music. He wrote a two-part article on the subject for Homeground Magazine, issues 65 & 66 (summer & winter 2000) and more recently in 2010 he was featured on the excellent three-part BBC Radio programme “World Routes in Madagascar” which can be listened to at the BBC website here, presented by Lucy Duran and featuring interviews with Paddy and others, well worth checking out. Celia Lowenstein’s documentary (which aired on Channel 4 in the UK in 1998) has since received limited repeats on Link TV in the US. I’m hoping that the considerable interest from many people who’ve contacted me about the film over the years will mean it can be made available in some format for people to enjoy. 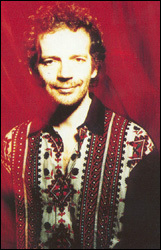 The album features a track called ‘Rakotozafy’, the man who was the inspiration for Paddy’s Channel 4 documentary (see below). The CD has recently been included in Tower Record’s critics poll of the 100 best World Music albums of all time at number 22! “Typically rich vocal harmonies, skipping upbeat tunes and some very fast finger work”. In the Jan/Feb 2006 issue of Songlines Magazine, for which Paddy writes, Kate Bush chose “Salegy Gasikara” from The Sunshine Within as one of her Playlist choices for that month’s cover-mounted CD. 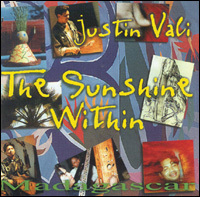 “I first heard Justin’s music through my brother Paddy, who has a deep love of Malagasy music. I love the quality of Justin’s voice, it is very manly and also has a softness that I find very seductive. He is a wonderful musician and his music is so full of joy.” He appears on The Red Shoes album. This excellent programme was finally screened on Sunday 30th August 1998. Paddy’s journey is indeed a spiritual quest as he finds delight and enlightenment pursuing the maker and legends of the music which invigorated his life at a time of self-doubt. The programme features Justin Vali, the famed valiha player who performed on Kate’s tracks Eat The Music and The Red Shoes. A wonderful insight into the country of Madagascar and it’s people, the programme makes a powerful yet simple point: music connects us all and sets our souls to flight. We have wings…. In Madagascar death is celebrated, not mourned. When a family has enough money they dig up the corpse, douse it in rum and have a party before wrapping it up in a new shroud and burying it again. In “Like a God When He Plays” musician PADDY BUSH is invited to Madagascar to follow the ‘famadihana’ or re-burial of Madagascar’s most famous musician Rakotozafy, who died 25 years ago. Whilst Rakotozafy has attained legendary status as the father of Madagascar’s traditional valiha, a kind of zither, little is known about his life. With this in mind Paddy sets out to learn more about his personal mentor and about the cultural impact that Rakotozafy’s work has on the Madagascan people today. Scarred by political instability and poverty, Madagascar only opened its doors to the outside world six years ago. In the early ’90s it was difficult to obtain Madagascan music, but today the valiha along with Rakotozafy’s music has been revived with a passion. 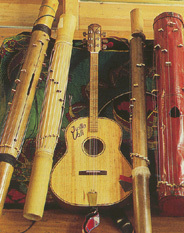 The valiha, truly an instrument of the people, consists of a bamboo tube with strings made from the filaments of bicycle brake cables. Starting his journey in Antananarivo, the country’s capital, Bush is led by musician JUSTIN VALI to a valiha maker and is regaled with stories of Rakotozafy’s own instrument, notorious for its innovatory construction from sheet metal. At the headquarters of Radio Madagascar, Paddy is introduced to FREDDY RENARISON, an artist who accompanied Rakotozafy during his first recordings in the ’60s. The recordings were merry and laid-back affairs. In Madagascar, time has a different rhythm and its cultural heritage is a strange hybrid of Welsh, French and African influences. Paddy, in pursuit of an insight into the world that inspired Rakotozafy’s music, meets up with historian and ex-Ambassador to England, SIR IRVIN BROWN, at the Archive of the London Missionary Society. Together they pore over the maps and photographs that document the country’s trajectory through British cultural imperialism and French colonial rule. Leaving Antanararivo, Paddy travels north east by car towards Ambohipasika, the village in which Rakotozafy lived and died, stopping off along the way to meet the local musicians and to learn about their inspirations. Ambohipasika lies near the southern shores of Lake Alaotra, the country’s largest lake renowned for its rice, fishing and sorcery. Musicians from as far-a-field as Paris have made the long pilgrimage to Rakotozafy’s final resting place in order to participate in his famadihana and to evoke the power of the ancestors alongside his family. Scented fires are lit, the tomb is freshly painted and a mat of reeds is woven to clothe the body. Paddy explains that “It’s the role of the musician to build a bridge between the world above and this troubled world”. Rakotozafy’s remains are brought to the dance and greeted with an affection and exuberance as if the man still lived. Then the father of the valiha is returned to his resting place, the tomb is closed up and the festivities finally abate. 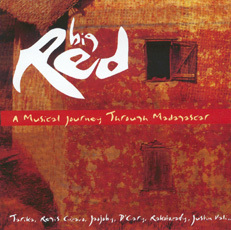 For an excellent introduction to a wide range of Malagasy grooves I highly recommend “Big Red – A Musical Journey Through Madagascar” (Nascente NSCD 053) which features many big names including Justin Vali, D’Gary, Regis Gizavo and Tarika. This compilation also features the uplifting track ‘Ramanjareo’ by the legendary Rakotozafy which was prominently used in Paddy’s documentary. 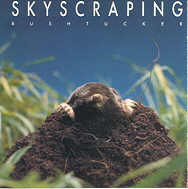 Bushtucker – Skyscraping CD: A few years back Paddy Bush along with Colin Lloyd-Tucker released “Skyscraping”. The title track has a glorious section of Valiha playing from Paddy and the album features a wealth of ethnic instruments and sounds. Fairly hard to find now, but well worth the search! Also, check out “Razana” the first solo album by the exceptional Paskaal Japhet, another Madagascan musician who has toured with the likes of Dead Can Dance. 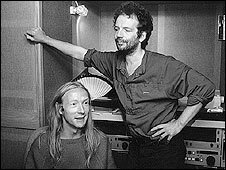 The album was produced by Paddy and released by Night & Day in 1994.